We crossed the border from Togo to Benin near Kossokouangou. The border formalities were quick and easy, no extortion of money here (like in Togo). I looked at some of the local villages on the way to Natittingou. During that drive the mounting bracket of the big cattle-guard bumper broke again (see Ghana). At the same time, the air conditioning quit working. But not to fear, my guide, Samuel, was really good in organizing things. He managed to find somebody on a Sunday afternoon to fix it. I visited a nice local museum, while he had the car worked on. Getting the car fixed took some time, so it was getting dark by the time we continued our drive. We headed north towards the Pendjari National Park for a 1 ½ hour drive at night. I stayed overnight at the lodge just outside the park for two nights. This was the only hotel/lodge during the tour that didn't have running water. They also ran out of cold beer. If you visit the Pendjari National Park, see that you stay in the hotel that is located in the park. It is a nicer place, and you save a lot of time driving to and from the park. The next morning we went on an early morning drive. I was late for that, because I didn't realize that Benin has a one-hour time difference to Togo. I saw a lot of animals during the morning drive. In the afternoon we had another game drive. Like always, there were not as many animals around in the afternoon. Later in the afternoon I wanted to walk to the waterfall that is just outside the lodge. As usual, they wanted to charge for the short walk to the waterfall. After the second night at the lodge, we headed back south to Abomey. This was one of the longest drives in one day. On the way we stopped at the Dankoli fetish shrine, the holiest of the Voodoo religion. They even didn't mind me taking a few pictures, even though this is not a tourist place, it is a real, active religious site. I also visited a couple of king's palaces. There were 12 kings in that region between 1645 and 1900, each of them built his own palace. I stayed overnight in Abomey. The Royal Palaces of Abomey are a UNESCO World Heritage Site. The next day we drove further south to visit Ganvie. Ganvie is a village on the water, reached only by boat. The buildings are build on wooden pilings in the water, all transportation is by boat. The market also is all on boats. I stayed overnight in a hotel in Ganvie. This was the most expensive place I stayed in. The dinner cost more than $20. This was the time I got a whole bunch of mosquito bites. The next day we took the boat back to the mainland and continued the drive south to Ouidah on the coast. 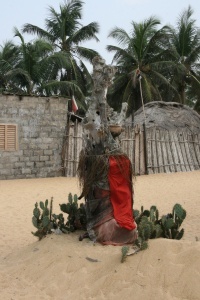 Ouidah is the birth place and main focus of the Voodoo religion. I visited two major Voodoo shrines, the Temple of the Pythons and the Sacred Forest, a place of worship for the Voodoo religion. 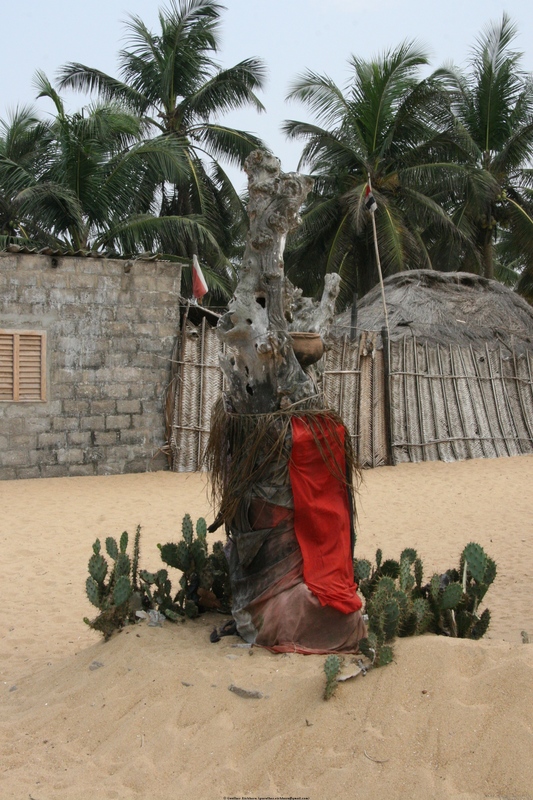 Ouidah was a major focus point o the slave trade. The Slave Coast (from Nigeria through Benin to Togo), the Gold Coast (in Ghana), and the Ivory Coast (Côte d'Ivoire) were the major slave trading areas during the 17th, 18th, and 19th century. I visited a museum about the slave trade in Ouidah, as well as several sites that remind of the slave trade, including the Port of No Return. One place was a holding place for slaves where they were kept in small quarters in the dark to see whether they could handle the sea voyage on the slave transport ships. The guide in the museum talked about how the slave trade worked. He said that he can't blame the white people exclusively. The slave traders usually did not go into the interior and abducted people as slaves. They gave the local kings money and weapons, and were given the subjects of the kings as slaves in return. After the overnight stay in Ouidah we headed west along the coast to Grand Popo. There we met another guide from Blastours and joined on an excursion to a local village to watch a Voodoo dance. This was quite interesting. The Voodoo dances are not staged for tourists, they are a living way of worship in the Voodoo religion. When we came by a small fishing village during the boat ride that followed, I saw one of the Voodoo Spirits getting ready for a Voodoo dance. This village was far away from any tourists. From the village we took a boat ride for a couple of hours along the coast. 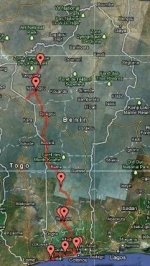 From there we continued west to the border with Togo. On that border, the border officials extorted some $15 from my guide. This money is taken without receipt and goes into their own pockets. When I started arranging the tour, Mimi from Blastours asked me what type of hotels I was looking for, 3-star or more basic. I opted for the less expensive, more basic hotels. It worked out OK for me. Most of the hotels that I stayed in did not have hot water, but with 30°C (90°F) outside temperature, you don't really need that. Fortunately, most of the hotels had air conditioning, which is certainly more important than hot water, especially in the south with the high humidity. All but one hotel had running water. In the lodge at Pendjari, there was no running water, I had to use water from a big bucket. Breakfast was basic, in many of the hotels they just had toast and butter and/or jam. Altogether, I was satisfied with the accommodations. I can live with basic facilities, I don't need 3-star hotels on such a trip. Food is not too expensive (except in Ganvie). Vegetables are not often included in the basic food. Some of the hotel restaurant food had vegetables, but not often. For beverages, I always stick with bottled water and beer. As almost everywhere in the world, the beer is German style lager beer, which is exactly what I like. It comes in small (0.3 liter (0.6 pints)) and large (0.62 liter (1.31 pints)) bottles. Unfortunately, all the hotels were greedy and only sold the small bottles, but for the same price as the larger bottles, so the beer was somewhat expensive in Benin. They charged between $2 and $4 for the small bottles. The bottled water costs about $2 for a 1 liter (2 pints) bottle. All along the roads you see small stores. There are basically no department stores in Benin. Usually, there are several stores that sell the same things clustered together. A lot of food and other stuff is sold at roadside stands. And street vendors that walk along the road are everywhere the traffic slows down. Traffic jams and toll booths create frequent business opportunities. We frequently bought fruit, nuts, etc from them. Agriculture is of course one of the main livelihoods in Benin. The main staples are millet and sorghum, and yam and cassava are the main root vegetables. In the center they grow of tomatoes and onions. Also in the center is an area where they grow cashew nut trees. Plantains and bananas are the main fruits that are grown in Benin. Traffic was usually not bad, only in Abomey did we have a bit more traffic, but even there it was not really bad. The roads we took were mostly paved. Further north there were some unpaved roads. In the central part, the paved roads were sometimes worse to drive on than unpaved roads because of the tremendous numbers and sizes of potholes. Most of the public transportation is in the minibuses (as in most of Africa). These minibuses run on assigned routes. The weather was the same as in Ghana and Togo. It was warm, around 30°C (90°F). It was very hazy, sometimes you could hardly see the sun because of haze, even though there were no clouds. This affected my pictures a lot, many of them seem to be very grayish. This is not a problem with the camera, it is a problem of the very strong haze that grays out everything. It did not rain while I was in Benin. People in Benin never seemed to smile. Everybody looked grumpy and unfriendly. Even the children were not smiling as much as in other countries in West Africa. Even the wait staff in restaurants was grumpy. It was really surprising to see such a negative atmosphere everywhere. It means Tourist Economy. It is just a way to extract money from tourists. In Eco Villages, everything costs money. Just walking around costs you. This was a bit of a nuisance at times. One big negative about the tourism in Benin is that none of the local guides spoke English, they only spoke French. That was quite a problem, since my French is very rudimentary, as was the French of my guide. If you charge for everything, you should at least have guides that can talk with you. I saw some interesting things of Benin (Pendjari Park, Dankoli Fetish Shrine, Abomey, Ganvie, Ouidah with the Voodoo Dance). The itinerary was selected very well for my purposes. But the attitude of the people gave me a quite a negative impression of my time in Benin.